Thread: Quilt for my husband- Imaginations needed! OK here is the challenge. 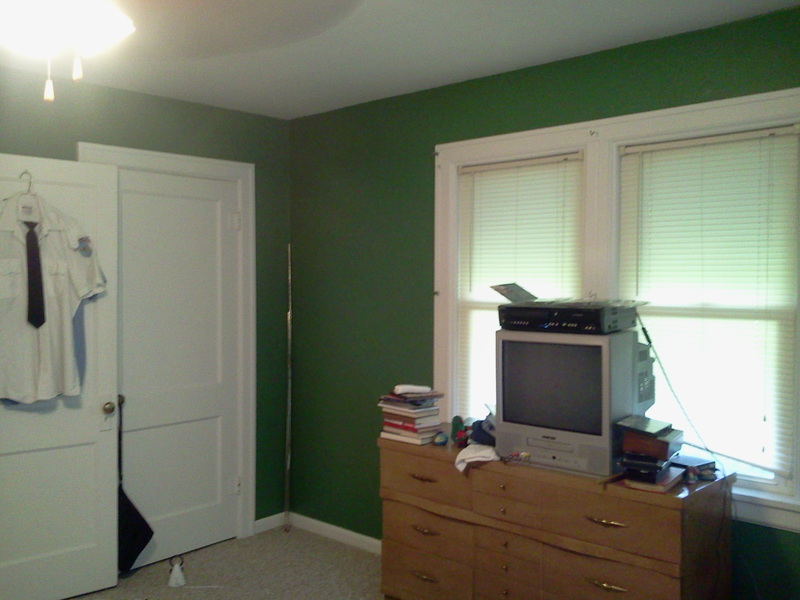 Below is a snapshot of my newly painted bedroom. (Hence the mess) What I need from you, is a specific precut (any type, jelly roll, layer cake ect), and a specific pattern for a queen size quilt that would suit a man in his late 20's, but still pretty enough to sit on our bed. It must match/coordinate with the walls in the picture! I am having serious trouble figuring out what to do with this one! Thanks all! How about a Jacob's Ladder? Check out the tutorial Jenny from the Missouri Star company has on youtube. I'm pretty sure she uses precuts. D9P would look nice. Or a trip around the world. Both would work- any ideas for a specific batch of colors/pre cuts? I am really having trouble with that part. Green cream with a splash of purple. Jelly roll or charm pack. What about a two color quilt like a double irish chain or tree of life pattern? Hunter's star in green and (grey or whatever color your carpet is)? Quilter2theend- what is a tree of life pattern? I googled it and came up with a bunch of different ones. Can you link one that you were talking about? I made a Pickle quilt for my son and his wife.... all greens and browns. I paper pieced a brown bear and placed it in the middle. It really was nice! Take a sample of the paint color, and go fabric shopping! LOL! Seeing your room color... batik fabric is what comes to my mind. Plan on making one of these very soon. How about a Hunters Star. I just can't bring myself to be limited by precuts, sorry. Since the room is so green, I wouldn't want to use to much more of that color in a quilt except as an accent color. But a gold or beige tone on tone w/a bit of green in it would be lovely. I also like Triple Irish Chain which could be done w/ strips. Another way to go would be a patterned scrappy quilt to add lots of color that DH likes. This could be very pretty also. What ever you choose be sure to post it! EDIT: The Jacobs Ladder in bright scrappy style idea would be my favorite choice for this room. Last edited by ube quilting; 06-14-2013 at 02:01 PM. greens, browns, beiges, and creams. throw some muted reds into it and maybe a pop of yellow cream. Turning 20.There ought to be plenty of greens out there to make a spectacular quilt! Good luck in you mission! I would use green & blue with a touch of yellow. Yummy! What other colors does he like? I would want the quilt to be lighter/brighter than these walls. So you could find varying lighter tones of the same green or add tans or taupes and cream. Maybe add some rust, orange, brick red for the bright accents. I purchased Elisa's Backporch Crazy Curves 7" template. The quilt pattern is included with the template. Elisa has video tutorials for cutting the fat quarters and sewing the curves. I prefer sewing the curves with no pins. It really is as easy as it looks on the tutorial. I think the quilt goes together so quickly because the blocks are big and consist of only 2 pieces. i've always liked the bear paw pattern - very masculine. This thread has been very timely for me. At the end of winter, when flannels were on big time sale, I collected for a lap quilt for hubby and also got scraps from a friend. I'm taking it to a retreat this next weekend. I like Jacobs Ladder, mega sized or Turning Twenty (+45 ish). I have green and reds to match our living room and I think I'll throw in some purple (an excuse for shopping). So thanks for the ideas, it's double duty, cause I can use this too. I think you need another color. Maybe navy? The green walls are very green and dominant, so I would use more of a compliment color with less green. Too much green in the room will just make you measurable. What ever you choose, just don't add flowers, men hate flowers. You have many suggestions from these talented ladies. I would love to see the quilt that you make. Plaid fabrics tend to make any pattern masculine, imho. What about any hobbies your husband has? Include some prints of thoses - fishing, motorcycles, reading OR work type prints - trucks, shields (for police officers/firefighters), etc.